The ExoMars project will be the 21st-century attempt to crack one of the most popular and intriguing scientific mysteries of the modern time - whether life ever existed on Mars. First conceived in Europe as a rover mission, ExoMars was later split into a two-part program developed jointly by NASA and ESA. With plans for returning samples of Martian soil pushed beyond 2020, ExoMars became the most advanced venture to explore the Red Planet during the 2010s. However by 2011, NASA essentially dropped out from the project, leaving it at the brink of the cancellation, unless Russia would agree to provide its rockets for the dual mission. 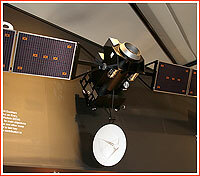 After several years of initial planning, in 2005, the launch of the ExoMars rover was delayed from 2009 to 2011. Around 2006, the project was broadened in scope but had to be delayed again from 2011 to 2013 and switched from Soyuz-2-1b to the Ariane-5 rocket, with Proton also under consideration. In October 2008, the project was delayed from November 2013 to January-February 2016. In July 2009, the ExoMars had to be delayed from 2016 to 2018, and switched from Ariane-5 to the US Atlas. According to plans formulated by December 2009, a NASA Atlas V 421 rocket was to launch the European Trace Gas Orbiter, TGO, and the Entry, Descent and Landing Demonstrator Module, EDM, in January 2016, with the goal of arriving to Mars in nine months in October 2016. From its 400-kilometer orbit, the Trace Gas Orbiter was conceived to use sensors capable of registering methane and other gases. During the 2000s, data from the European Mars Express spacecraft confirmed the existence of methane in the Martian atmosphere. Biological organisms on Earth are known to be a major source of methane in the atmosphere, however the origin of the same gas on Mars remained a mystery. If the orbiter could be able to pinpoint exact sources of methane on the surface, these areas could be further scrutinized with imagery. The Trace Gas Orbiter would have to complete most of its scientific tasks by the end of 2018, when it was expected to primarily become a data-relay center for a pair of incoming rovers. These proposals were controversial, given the fact that Russia had long abandoned the use of the Proton rocket for science missions, due to its high cost and the commercial demand for the workhorse vehicle. After 1996, all Russian planetary missions had been redesigned to fit onto the Soyuz or Zenit launchers. Not surprisingly, the European proposal triggered an initial rebuke from the Russian space agency. On Oct. 16, 2011, the Izvestiya newspaper quoted First Deputy Head of Roskosmos, Vitaly Davydov, as saying that the idea had not been exactly constructive. "It can hardly be called a proposal -- just give them a rocket and that's the end of it," Davydov said, "We are not magicians, so we could simply launch somebody else's vehicles for nothing, for which we would be given some sort of information. Moreover, this information is of interest of the Academy of Sciences. If the Academy of Sciences proves that it is very important information and worth the cost of that launch vehicle, then we could negotiate. However so far we have not seen that." (In Russia, the Academy of Sciences formulates the space science program and applies for funding from Roskosmos). A similar reaction came from the head of the agency's TsNIIMash research institute, Gennady Raikunov, who happens to be a member of the joint Russian-ESA working group. Upon learning about the US-European proposal from the Izvestiya reporter, Raikunov said that none of previous discussions with the Europeans had considered any joint Mars missions and no such proposals had been received. Despite this initial embarrassment at the political level, the Russian scientific community seemed to be interested in the project. Oleg Korablev, a leading planetary scientist at the Moscow-based Space Research Institute, IKI, told Izvestiya that the European spacecraft could be used as a carrier of Russian experiments and as a data relay station for (future Russian) missions. Then, in November 2011, came the disastrous launch of the Phobos-Grunt mission, putting in doubt the very ability of the Russian key and only planetary spacecraft developer -- NPO Lavochkin -- to lead ambitious projects. On November 14, Korablev participated in a meeting of the Space Council at the Russian Academy of Sciences, which considered Russian participation in the ExoMars project. 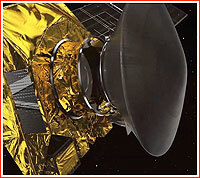 The endorsement of the Russian participation in ExoMars by the Space Council was considered absolutely crucial for the approval of federal funding to purchase a much needed Proton rocket. During the meeting, Russian space scientists formulated "minimum" and "maximum" concepts for possible Russian participation in the 2016 ExoMars launch. Both options included the installation of Russian-built scientific instruments on the 2016 orbiter. These instruments would derive from previous Russian science payloads, which had previously flown onboard NASA and ESA probes. 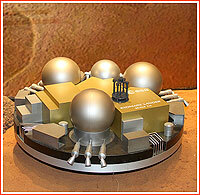 However, much more ambitiously, Russian team decided to propose its own landers for the 2016 mission. 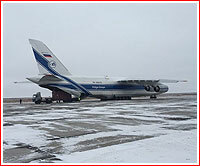 Although a Proton rocket with a Briz-M upper stage could carry an extra payload, Russian scientists hoped to convince their European counterparts to drop ESA's 700-kilogram landing demonstrator and replace it with multiple Russian landers. IKI scientists hoped to revive landers which had originally been developed for the ill-fated Mars-96 mission. One lander would be a small-size penetrator with an inflatable heat shield, developed in cooperation with the Finnish Meteorological Institute. It would carry a miniature weather station. The second type of lander would be based on a small octagonal platform landing with the help of inflatable bags. Russian scientists hoped to acquire a state-of-the-art seismometer developed by the French Space Agency, CNES, to conduct cutting-edge studies of the Martian interior. CNES had already been working on the installation of the seismometer onboard NASA's Insight spacecraft. A critical meeting between European and Russian teams on possible cooperation in the ExoMars mission was scheduled for November 18, 2011. By April 2012, the Space Council of the Russian Academy of Sciences, RAN, which formulates the nation's space science program, approved the Russian participation in ExoMars. During a meeting in Moscow on April 6, heads of Roskosmos and ESA signed a Declaration of Intent, which could lead to a full-scale Russian-European agreement as soon as in November 2012. However, the project was yet to secure funding in Europe and Russia. Part of Russian funding for the project could come from the R1.2-billion insurance payout for the failed launch of the Phobos-Grunt spacecraft. On the European side, only 850 million Euro out of required one billion was reportedly secured. By the Spring of 2012, Russian space officials agreed to provide a pair of Proton rockets to launch both ExoMars missions -- in 2016 and 2018. The Mars-orbiting mission slated for launch in 2016 would carry a trio of Russian-built spectrometers, collectively known as Atmospheric Chemistry Suite, ACS. Developed by a team of scientists from Department 53 at Space Research Institute, IKI, these instruments would be used for studies of atmospheric gases and traces of volcanic activity on Mars. The group would also supply an avionics box, ACS-BE, designed to gather and transmit scientific data from the instruments. Another IKI spectrometer would be used for the search of subsurface water on the planet. In the meantime, the EDM lander on the same mission would be equipped with a Russian-built radioactive heat generator, which would dramatically expand the life span of the vehicle on the frozen surface of Mars. 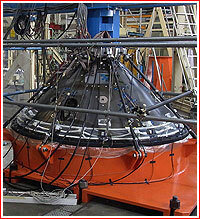 Several Russian instruments could also be delivered on the surface of Mars with this lander. In 2018, a Russian-built radioactive heat generator would be installed on the ExoMars rover, along with possible suit of Russian instruments. Another set of instruments could be installed on the stationary landing platform, which was intended to deliver the ExoMars rover onto the Martian surface. The ExoMars cleared a major hurdle on May 2-4, 2012, as partners involved in the project held a meeting in Turin, Italy, the home of the key contractor on the spacecraft - Thales Alenia Space-Italy. The event included Astrium UK, ESA, the Italian space agency, ASI, NPO Lavochkin, GKNPTs Khrunichev and Moscow's Space Research Institute, IKI, the University of Padua and the Astronomic Observatory of Capodimonte, Thales Alenia announced on May 8. The meeting defined various system aspects for both missions, as well as the interfaces between Russian and European instruments, including scientific instruments provided by Italian partners. These instruments will be used on the Entry, Descent and Landing Demonstrator Module, EDM, in the 2016 mission and on the Rover Module being built by a Thales Alenia Space-Italy-led team and the Russian Descent Module, DM, for the 2018 mission. Extensive interface and programmatic discussions took place in view of freezing all details and agreement in June. Program development was proceeding on schedule for both missions, and the different program milestones have been confirmed, Thales Alenia said. The 2016 mission is now in the C/D (design & development) phase, following a successful System PDR (Preliminary Design Review) in December 2010 and the Trace Gas Orbiter's PDR in December 2011. PDRs for different subassemblies and components are in progress and the timetable for the Critical Design Reviews, CDR, has been established. With this interface meeting, decisions by the ESA Council and a system CDR slated for November 2013, the program is proceeding on schedule and is considered stable. Deliveries for the 2016 mission will start with the Engineering/Functional models of the avionics test benches and the Structural-Thermal Model of the EDM starting before the end of the year. The Final Acceptance Review, FAR, and Qualification Review, QR, are planned for September 2015, leading to the launch campaign and then spacecraft launch in January 2016. The 2018 mission has been reconfigured and is now in phase B (feasibility), to culminate in March 2013 with the System Requirement Review. The development phase will then kick off, leading to the system PDR in January 2014 and the system CDR in January 2016. The system Final Acceptance Review, FAR, and Qualification Review will be held in October 2017, followed by the launch campaign and then a launch scheduled for May 2018. Thales Alenia Space Italia is the industrial prime contractor for the ExoMars program, as well as being in charge of the design of the Entry Descent Demonstrator Module, EDM, the development of the Analytical Laboratory Drawer, ALD, which includes the Pasteur Payload instruments, its integration on the Rover, the onboard computer and the EDM’s radar altimeter. Thales Alenia Space France is responsible for the design and integration of the Orbiter module, Thales Alenia said. The Russia's controversial decision to provide Proton launchers for ExoMars did not resolve all the problems facing the project. 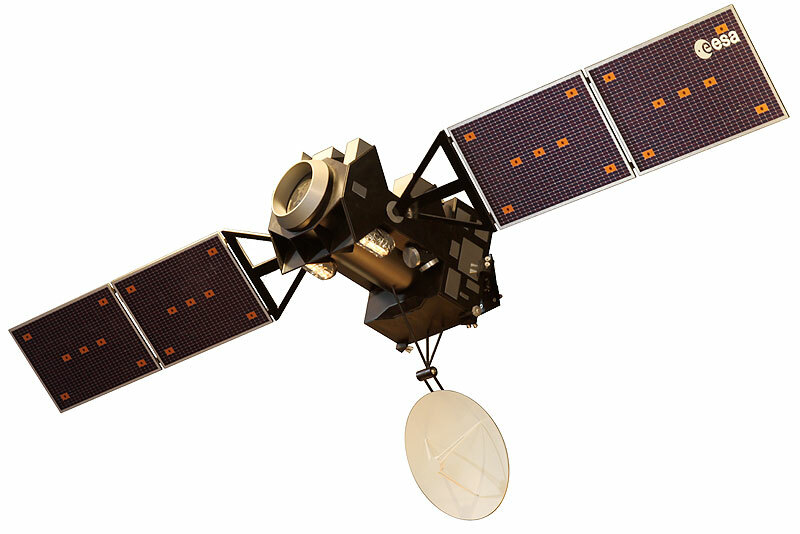 Its escalating cost was yet to be covered by ESA, while hardware developers had very tight deadlines to meet for both -- the 2016 and 2018 mission. In the middle of May, ESA announced that "an independent assessment concluded that the current schedule for the 2016 mission could be met, enabling the release of funds to industry until the end of June." The statement made it obvious that the project's coffers had enough money to keep it going for just a month and a half. At the time, the detailed design of the Trace Gas Orbiter was progressing, with special emphasis on the updated interfaces with the Proton launcher and the scientific instruments supplied by Roskosmos. The selection of the suppliers for all the spacecraft elements was promised to be completed by September 2012 with 80 percent of the contractors already selected and 60 percent of the contracts signed, ESA said. In the second half of 2012, functional models of all the spacecraft electrical equipment was to be manufactured and integrated into an electrical model of the complete spacecraft -- the Avionics Test Bench -- which was to serve as a platform to verify the orbiter’s functional design. The EDM teams have completed the challenging task of revising the surface platform accommodation design after the inclusion of the Russian scientific instruments, radioisotope thermoelectric generator and radioisotope heater units. A review of the preliminary design of the DREAMS science payload was under way as of May 2012. Several tests with the full-size model of the mechanism that would give the correct separation velocity and spin rate to the EDM when released from the orbiter have been successfully completed, as have tests with the full-size model of the EDM surface platform crushable structure, which was designed to limit the landing shock and avoid damaging the lander equipment. The data gathered during these test campaigns would support the finalization of the detailed design, which was to be completed in the summer of 2012. On. Sept. 4, 2012, a delegation from NPO Lavochkin traveled to Europe to discuss areas of responsibilities by two sides in both ExoMars missions. Before the end of 2012, Roskosmos started funding three contracts worth 306 million rubles and covering the development work on ExoMars mission in 2013 and beginning of 2014, sources at Moscow-based Space Research Institute told the RIA Novosti news agency. Along with the development of science instruments, these money recovered from the insurance payout for the loss of the Phobos-Grunt spacecraft, were to fund the science data-processing and archiving system for the project. However a formal agreement between ESA and Roskosmos on the mission which was endorsed by European ministers on Nov. 19 and was to be signed by two agencies on Nov. 27, 2012, had to wait until Jan. 20, 2013 or March 2013 as the latest, thus threatening to derail a very tight schedule. The delay was reportedly caused by the requirement of the Russian Foreign Ministry to increase the Russian role in the project, which in turn triggered a chain of additional reviews on the European side. Heads of two agencies reportedly discussed the problem on December 21 and committed to resolve the issue in the first quarter of 2013. Head of Roskosmos Vladimir Popovkin and ESA Director General Jean-Jacques Dordain along with industry leaders involved in the ExoMars project met again in Moscow on Jan. 22, 2013, and hammered out the final draft of the ExoMars agreement. According to Roskosmos, Dordain confirmed that the ESA council would approve the document on March 13-14 and two heads of agencies would formally sign it in Paris a day later. 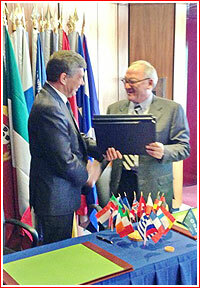 On March 14, 2013, Roskosmos did confirm that the agreement was penned as planned. According to ESA, during 2012, preparations for the ground segment were proceeding and its requirements were successfully reviewed in October. A large part of the 2016 mission ground segment could also be used for the 2018 mission. During 2012 about 50 percent of the propulsion equipment flight models for the orbiter have been delivered, while the propulsion engineering verification model is undergoing tests. The manufacturing of the flight model structural panels has started and the test of the central tube proto-flight model is being prepared. The functional model of the Orbiter’s on-board computer was delivered in November. This was the first building block of the Avionics Test Bench, which was to allow the validation of the electrical interfaces and initial versions of the software. All structural model elements of the Entry, Descent and Landing Demonstrator Module, EDM, have been manufactured and were to be assembled by the end of 2012 at Thales Alenia Space Italy, in Turin. A test campaign was scheduled for the first half of 2013 and was to include vibration tests to simulate the launch environment and static tests to simulate the forces that the EDM will experience during entry and parachute opening. Development and test activities for all EDM subsystems were ongoing. In particular, for the parachute system, several tests have taken place, including a wind tunnel test in supersonic flow, a drop test from a helicopter and deployment tests with the mortar, ESA reported. In Mid-February 2013, the structural model, SM, of the descent module for the ExoMars 2016 mission was transported from by road from the Turin facility of Thales Alenia Space, where it was integrated to ESA's European Space Research and Technology Centre, ESTEC, in Noordwijk, the Netherlands, for tests, ESA announced on April 8. On June 17, ESA said that the ExoMars project had entered the final stage of construction with the signature of a contract between the agency and Thales Alenia Space at the Paris Air & Space Show. At the time, the EDM was completing structural tests at the company's laboratories in Turin. On November 8, ESA announced that the entry, descent and landing demonstrator module that will fly on the 2016 ExoMars mission had been named "Schiaparelli" in honor of the Italian astronomer Giovanni Schiaparelli, who famously mapped the Red Planet's surface features in the 19th century. 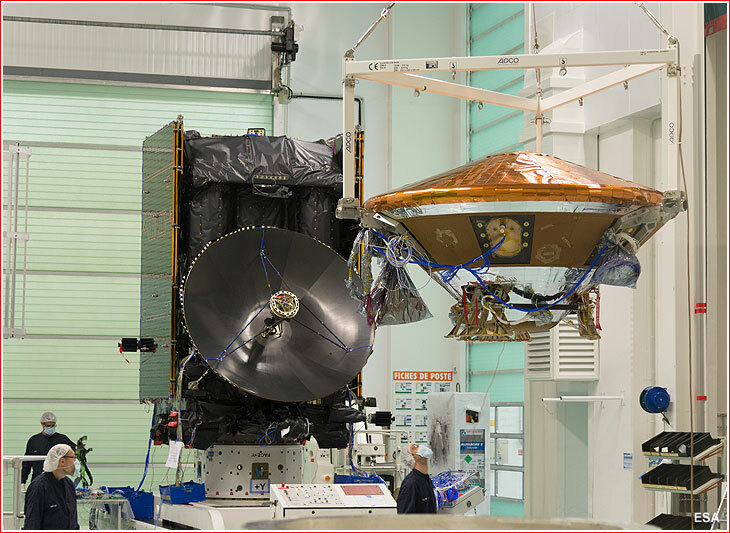 On February 3, at an official ceremony in Bremen, Germany, OHB System transferred the ExoMars Trace Gas Orbiter module consisting of the spacecraft structure, thermal control and propulsion systems to Thales Alenia Space France. According to ESA, the handover marked the end of an intense construction and test period readying this core module to be used as the basis for integration of other TGO subsystems and units, including the science instruments. In 2015, the orbiter and the lander for the ExoMars-2016 project entered the final stretch on the road to the launch pad. Preparations generally went well, but last-minute problems kept cropping up one after another until they finally forced a delay to the launch of the mission from January 7, 2016, until March 14 of the same year. Schiaparelli, also known as the ExoMars Entry, descent and landing Demonstrator Module, EDM, being craned into position for mating with the Trace Gas Orbiter, TGO, in the Cannes facility of Thales Alenia Space, France, on 11 April 2015. 2012 October: Requirements for the ground segment of the mission is successfully reviewed, according to ESA. 2013 Jan. 22: Head of Roskosmos Vladimir Popovkin and ESA Director General Jean-Jacques Dordain meet in Moscow to hammer out the final draft of the ExoMars agreement. 2013 February: The structural mockup of the EDM descent module for the ExoMars 2016 mission was transported by road from the Turin facility of Thales Alenia Space to ESA's European Space Research and Technology Centre (ESTEC) in Noordwijk, for tests. 2013 April: The structural mockup of the EDM descent module undergoes vibration tests at ESA's European Space Research and Technology Centre (ESTEC) in Noordwijk, for tests. 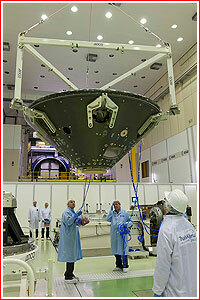 2014 Feb. 3: OHB System transfers the ExoMars Trace Gas Orbiter to Thales Alenia Space France. 2016 January (later postponed to March): A Proton rocket with a Block DM upper stage to launch the Trace Gas Orbiter for the ExoMars project from Baikonur. (The chosen launch vehicle configuration included the Briz-M upper stage, not Block DM). 2016 October: The Trace Gas Orbiter to release a landing spacecraft into the atmosphere of Mars and enter orbit around Mars. 2019 January: A US and a European rovers to land on Mars.